Topics: Accounts Receivable Financing, Purchase Order Financing, Asset Based Lending, Freight Factoring, and Construction Factoring. 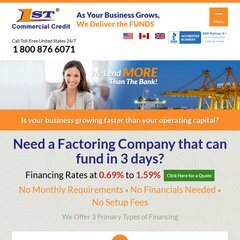 1stcommercialcredit.co.. Invoice Factoring Questions and Answers - Accounts Receivable ..
1stcommercialcredit.com's IP address is 216.104.176.247. Its 2 nameservers are ns2.tierra.net, and ns1.tierra.net. Tierranet Inc. California is the location of the Apache server. PING www. (216.104.176.247) 56(84) bytes of data. A ping to the server is timed at 67.0 ms.